The company you choose for your rapid plastic prototyping is important. 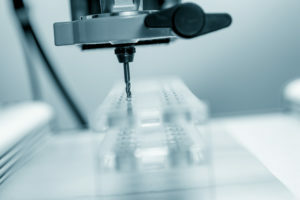 After all, your prototype could be used to secure a fleeting sales opportunity, ensure your design is ready to enter a costly production process, or satisfy the strict requirements of the FDA or other standards boards. A lot is leaning on the success of your prototype, so you’ll need to be sure it’s accurate, attractive and ready when you need it. When the success of your prototype is critical, choose CNC machining with a trusted company like Reading Plastic. Here are 5 reasons machining is the way to go for rapid plastic prototyping. Faster Delivery. We’ve talked before about how machining cuts down on tooling costs and duration compared to other methods like plastic injection molding. That’s because with CNC machining, you don’t need to take on the immense cost of creating a mold; our CNC machines whittle down the plastic directly. There’s no faster way to get a prototype in your hands. Tighter Tolerances. When it comes to holding close tolerances, no method is superior to machining. Our process yields parts within .001 inches of the specifications. If your prototype must be as precise as possible to avoid inaccurate feedback during a testing period, machining is ideal. Better Surface Finishes. Selling your prototype to a client is hard enough; it’s even harder if the prototype has cosmetic defects related to injection molding or rough layer lines from 3D printing. For a prototype that looks and feels like the final product, you need to machine it. Fully Functional. With precisely flat mating faces and threaded holes, your part can be fully functional for your testing period. Empower your client or higher-ups to experience your product as you intend it to be, rather than become distracted by flaws created during the manufacturing process. Create multiple custom versions. With machining, it’s easy to tweak the design to create multiple custom versions of your prototype. That means you can better prepare for the manufacturing process by fine-tuning the design you want. It also means you’ll have multiple prototypes to put forward for approval by a standards board. Contact Reading Plastic Today For a Free Quote! We hope we’ve convinced you machining is the best choice for rapid plastic prototyping. If you’re ready to get a quote on your prototype, contact us today. Our experts can weigh in with more details on what’s best for your particular project. Whether it’s prototyping or completing the entire job to extremely close tolerances, you can count on Reading Plastic.